Yes, I am FINALLY making good on my word to start writing again. Gastroparesis awareness is something that I am passionate about but I admit that I needed to step away for a little while. It can get frustrating and tiring fighting and advocating for something that is so difficult for people to understand. Another reason that I stepped away for awhile was to plan my wedding! Yes, that is actually me and my husband on our wedding day in the photo posted above. As anyone with Gastroparesis knows, there is only so much that can be accomplished at a time without a good old fashioned nap! Naps are a glorious thing for anyone, but it is even more glorious when you have a chronic illness. In fact, naps become a downright necessity. (Sorry for that tangent!) Given that we were planning a wedding and making a TON of decorations, something had to give in order for me to survive. My health has been holding up well, but when I tank, I tank HARD! I still have times where it is like someone switches a light switch off. One moment I will be fine and the next moment I can barely walk from exhaustion. Add some stress to the mix and it is a recipe for disaster. In addition to our wedding, we also hosted a big family picnic the night before. We had A LOT of relatives traveling long distances to attend and we wanted to see them as much as possible. To be honest, the picnic was more stressful than the wedding. I had been pushing myself pretty hard in the weeks leading up to the wedding and at some point during the picnic the light switch turned off. I was exhausted, dizzy and couldn’t really eat anything. I felt like a zombie at a couple of points. Thankfully, I made it to bed early and felt better the morning of the wedding. (I’ll admit some Zofran definitely helped!) My 2 bridesmaids and my mother really kept the vibe calm and relaxed. I’m so thankful to them and how well the understand that Gastroparesis is so random. 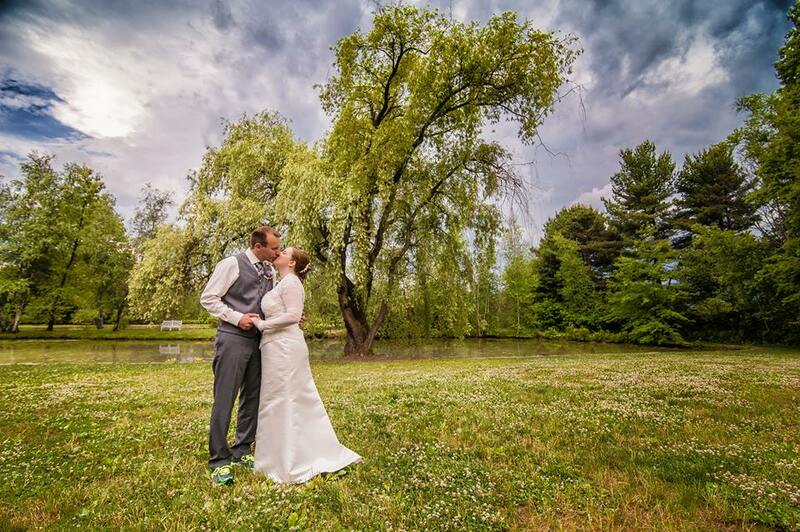 I will say that Gastroparesis actually played a role in making our wedding day magical. It was an outdoor wedding with the reception in a pavilion. We had yard games and s’mores planned. Shortly into the reception we were greeted with a torrential downpour. We laughed it off and kept the party going. So much of a chronic illness is, as the saying goes, learning to dance in the rain. Well, we literally danced in the rain! A chronic illness like Gastroparesis teaches you to just roll with the punches and make the best of any situation. You learn very quickly that you can let things that you can’t control dictate your mood. Only you can dictate your mood. Yeah, sure, have a moment to think “this really stinks” but then let that moment pass and remember that where there is rain you will find a rainbow! I found the rainbow that is my husband and I hope that you find your rainbow too! I really like the photo and you both seem quite happy. What a perfect background, I was admiring everything then saw his shoes and had to chuckle a little.